I seem to have to clarify where things are going in case someone from our Postal system reads this, and of course I did not save my receipt after one week because I have never had a problem before til now. So Lesley is out postage. Oh well, on to other things. And, I have been sketching, no I don't have any more to show you today but yesterday I took a book from the library that I have here at home and saw these sneakers so I had to tackle it. It was very detailed and I think, if you know me, that is what attracted me to it was all the detail. I am a detail person and well I was quite pleased with the end result, another day for sketches, I didn't want to bore you all with them. And...I am doing an ATC swap with another blogger who has been following me for quite some time, and I am not sure if she will be looking so I won't mention any names yet. I am doing a matchbox swap as well for March and so who knows where these or which one is going where. I love the fairy ATC, I added some wired music wings to her and crackle painted the gate behind her. Added some flowers with Stickles,I really like how this turned out. The fairy is raised up off the card with some foam tape. She turned out better than I expected....I wonder where she is flying off to next??? 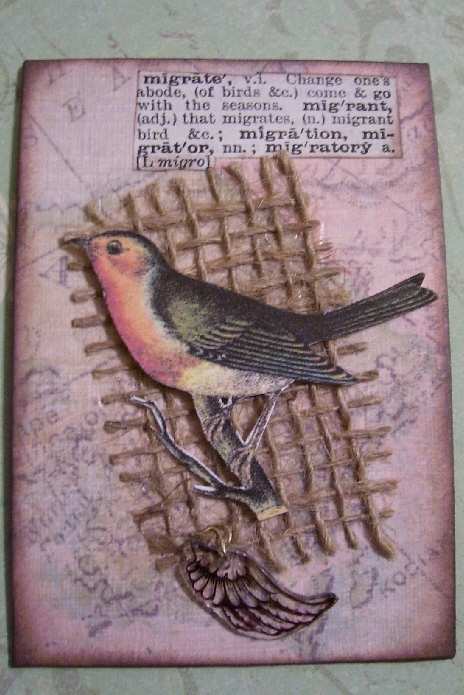 This one is titled " In my Garden"
And this card is called Migration. I used K and Company scrap paper, the background is a faded map of North America, the bird is from the Graphics Fairy, thanks Karen, the word "migrate" is from a dictionary I use when I want definitions in my art, some burlap and I had a shrink plastic wing charm that I wired through the burlap. Birdie is migrating to somewhere, I wonder where. 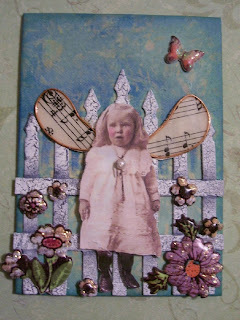 I haven't made too many ATC's of late and I really enjoyed it. I really think mine out, they don't just happen over night...it is a rather long process with me, sometimes too long. Well I have several projects in the works, one is going to take quite a while as I am designing it for the Gecko Galz Guest Artist spot in August. Another project I am working on is an altered tin with an accordion book inside, I get a newsletter from Paper Whimsy and Nancy Maxwell James has done it again. My book is going to be a bit different but that is what I like about art, you make it how you like with the help of inspiration by others willing to share their ideas. Well that is it of now my dearies. Lesley...these are both just too cute!! Your little angel turned out fabulous! I love the wings..and flowers!! Just Beautiful! We had an awful snow storm, 14 in. here,trees down every where and no power for 3 days. Hope the mail gets to you! You do have a lot going on Lesley. That's interesting about thinking UK was Ukraine, I've not heard that one before, but it does explain why your matchbox didn't reach Jan. I'm thinking I'll have to put United Kingdom in full from now on - just in case - lol. Do you see what I see??? ?